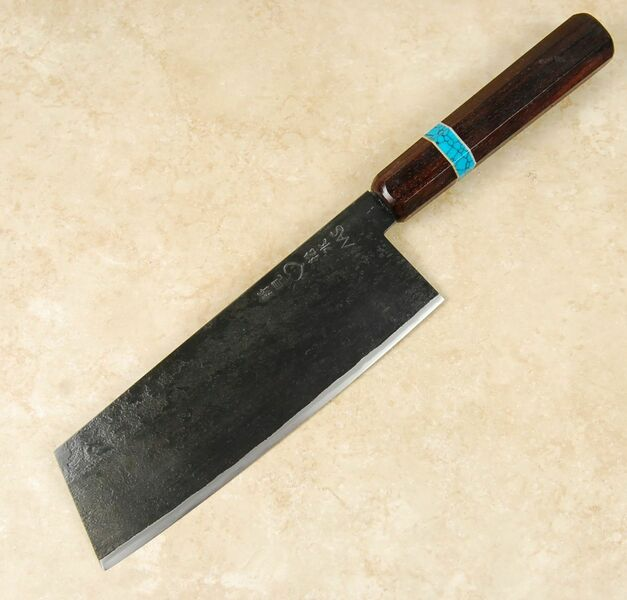 The knives made by Shosui Takeda are among the most recognizable in the Japanese kitchen knife world. Their ultra-thin grinds, over-sized dimensions, and smooth kurouchi faces set them apart from most other makers and designs. Made from one of our favorite steels, Aogami Super, these great looking blades are forged entirely by the hand of Takeda-san. He makes two varieties of his blades: one with an iron cladding and one with a stainless outer layer. This is the stainless variety, which obviously makes daily maintenance far easier that with its sibling. While smoother and more uniform than the kurouchi finish on the Classic line, the aesthetic integrity of his Stainless Clad line still elicits the same wow factor. The knife sports a 50/50 compound S grind with an exceptionally tall and thin edge bevel. The Aogami Super steel is treated to achieve a 62 rating on the Rockwell Hardness scale which allows the knife to retain its ductility, while still being capable of superior edge taking and holding characteristics. This is a wonderful do-it-all knife which should find favor with users wanting a tall blade for extra board clearance. 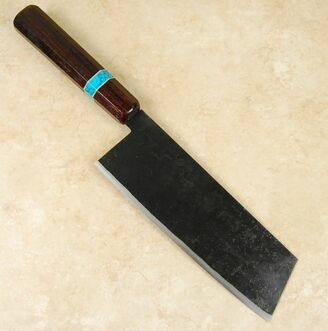 The flat profile will especially appeal to those chefs who like to push cut. 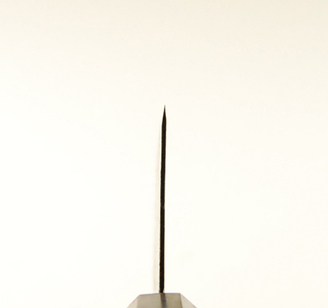 We have mated this fine blade to an equally fine custom handle, which results in a package that is hard to resist. Please know that all measurements are approximations! 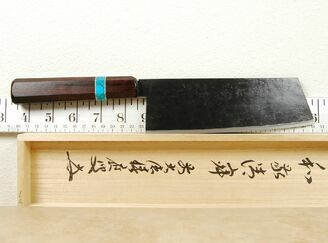 Takeda-san and his helpers make each of these knives by hand, without a template. As a result, every knife is unique and the stats will vary. **Please see custom saya page for saya information. Razor sharp, easy to sharpen, great length, my go to knife for general use.